The inviting Orchard Garden, part of of the 14-acre Santa Fe Botanical Garden on Museum Hill, makes the most of local resources. Its cactus are native to the Southwest; the lush roses and fruit trees thrive on rainwater collected in Zuni-style stone bowls and stonework channels created by New Mexico craftsmen. 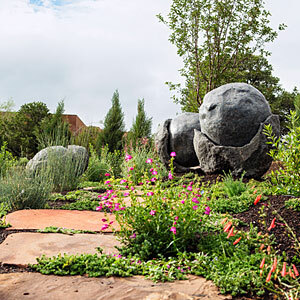 And set among carefully chosen native and non-native plants is the sculpture Emergence by Santa Fe artist Candyce Garrett.